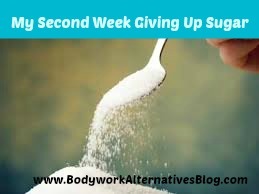 After two weeks of drastically reducing my sugar intake – I feel awesome! I didn’t lose as much weight this week, but I’ve lost 2 inches around my waist! My clothes feel better, I don’t feel swollen, my energy feels even and I feel free. I wasn’t exercising the last two weeks as I wanted to just focus on what I was eating. However, I decided to start adding exercise back in as I’m starting my third week. It was very freeing when I started my workout today. Usually, I begin my workout thinking I need to exercise as much as 90 minutes so I can burn off the junk I ate that day. But today, I was able to get onto the treadmill and set a goal of rotating walking and running every five minutes for thirty-five minutes and feel a huge accomplishment. I was aware there are sugars hiding in nearly everything I eat, but had focused my first two weeks on avoiding pop, juices, and sugary treats. I’ve decided to start tracking all sugar I’m eating this third week. I researched the amount of sugar grams I should consume per day. I have found the American Heart Association has 25-30 grams as the maximum recommended sugar intake. I’ve decided to stay below this daily amount. I’ve also set a daily amount of calories I am allowed to eat. I believe between this plan and exercising five times per week, I will see an average of a 2 lb. weight loss. I will use MyFitnessPal to track my calories and sugar. It is a free app. I especially like clicking on complete entry and seeing my expected weight after five weeks of eating similar to that day. Are you reducing your sugar in your diet? Share your story with us. We are often asked by our clients the best position for sleep. We found an article written by Jonathan FitzGordon, In this article, the author explains the best positions for sleep. Sleeping on your stomach is the worst sleeping position. It compresses the back. On the side with one leg hiked higher than the other. This is also not an ideal sleeping position. It twists and torques the pelvis. Sleeping on the back with both legs straight and without a pillow is a good sleeping position. Sleeping on your side with hips stacked is also a great sleeping position. There you have it if you are looking for the best sleeping position – choose on your back or side sleeping with hips stacked.